*Copyright, 2008 by Joseph Alwyn Valu. At the Myitkyina airstrip massacre site some ten thousand civilian women and children were said to have perished that day: Anglo-Indians, Anglo-Burmese, Indians, English, Jews, some Burmese and a few Chinese. From a concerted destruction of all the commercial planes on the Myitkyina airstrip, with probably scores of British wounded servicemen, and dozens of English women and children trapped screaming piteously in them, to the continued merciless strafing of the dead and dying on the open field, the Japs had a field day becoming more vicious and strong with each onslaught as though the airmen were in the throes of a bi-polar episode. It was, indeed, a slaughter of the Innocents. Later that evening, ,during a long lull in the raids, we were struggling along the dusty road with poor Helene walking listlessly with Mum�s arm around her shoulder, with cousin Emily Xavier overseeing a group of lost crying small children whose parents were dead or lost to them---whom she had herded together with such love and affection--- holding onto her sari for security; and a stream of refugee women and children, like us, bereft of all worldly possessions except the clothes we were wearing, wearily trudging back to Myitkyina town, since our last hope of escape to Calcutta had been blitzed. Some distance up that road we heard a speeding vehicle, and soon saw in the distance a large British Army truck approaching us, racing at full speed toward Myitkyina. All of a sudden, to our utter shock and dismay, Emily, who was then a lovely young woman of about twenty-three and very timid and self-effacing in nature as a young Indian woman of the times was supposed to be, stepped in the middle of the road! With waving arms she signaled the careening truck to stop, which it did, almost running her over and with screeching brakes, and out jumped a British officer red with rage. He kept calling her words which were quite unintelligible to me (that�s how much we were protected by our family and school) but which turned out to be filthy expletives which he heaped on her, calling her a �Blackie� with each tirade which I knew meant �Indian� by our recent masters. She, instead, ignored the abuse and emotionally and sweetly kept on begging him to take a couple of adults and the small children to Myitkyina because they had been devastated by the loss of their parents, not eaten or drank any water since morning, and were too weak and unable to go any further afoot. Suddenly the officer gave her a thundering slap to her head which spun her around and, losing her balance, she collapsed in a crouching position, her left hand holding up her body shivering in fear. She quickly recovered, got back on her feet and spat a goodly blob of spit in his face, and told him a few home truths which I also failed to understand, but which were surprisingly well delivered by such a young sweet girl my shy cousin had been a few minutes ago. Taken aback, and mopping his face in shame with his sleeve, the officer got back into his truck and drove off in a thunderous rage, the vehicle throwing smoke and pebbles all over us. Promising to return, they gave chase to the fast moving truck. For many years I believed that statement to the little child was a cute way to indicate, without detailing it to the kid, that the officer was violently gotten rid off by them. That thought became more believable to me when I remembered that the northern most extension of the rail line of the Burma Railways ended at Myitkyina station itself, and did not proceed further to the airstrip. In point of fact we were probably the last to arrive in Myitkyina by train from Katha (correction: Mogaung) on May 3, 1942, just a little ahead of a swift Japanese pincer which skirted the town to block egress to the China border a few miles to the east. However, in rethinking this entire event I had earlier missed the fact that the British officer had disappeared along with the jeep the men were driving and they would not have left that essential vehicle on the highway for the oncoming enemy�s use, but had allowed him to take it as an exchange. Although this is pure speculation on my part, what probably happened was: the Anglo-Indian gentlemen in the jeep had cutoff or signaled the officer to stop (because of the radio silence) and discovered that he was the first British army courier to take advantage of a lull in the raids that evening to speed to their base in Myitkyina to inform H.Q. of the devastation the Japanese Air Force had reeked on the ambulance brigade, commercial airliners and civilian refugees on the strip. A gentlemen�s agreement probably then ensued which allowed the officer to proceed with his mission in their vehicle if they kept silent about his lack of official decorum, to put that mildly. That such a bizarre act may have occurred was no different than the dozen or more which must have played out on that dismal day. We, of course, would never know what actually transpired but had to put that incident and others from our minds in our continued effort to get back to town. Emily Xavier, a favorite cousin of mine, had lived with our family for many years after the sudden death of her father, a barrister, in London. 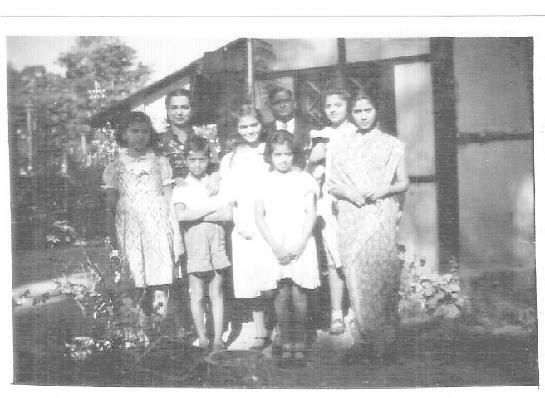 She surprised us�and angered Father, who was a Captain in the British Army of Burma hiding in plain sight---when she suddenly left us in Maymyo to join the Rani of Jhansi Regiment, a women�s auxiliary of Subhas Chandra Bose�s Indian National Army, in 1944. That her anti-British sentiment was occasioned by their terrible let down of Indian refugees attempting to escape to India at the Myitkyina airstrip, together with the personal affront and trauma she suffered at the hands of an unnerved British Army officer on the road to Myitkyina on May 6, 1942, may give insight to her decision. That her move was possibly Providential in nature was very well told in my sister Sheila�s book At Long Last Liberation, (Authorized Edition) Copyright Sheila M. Valu and Joseph A. Valu (ed.) 2006. Unpublished.